How do I prevent certain combinations from appearing using the "Married Pair" feature? 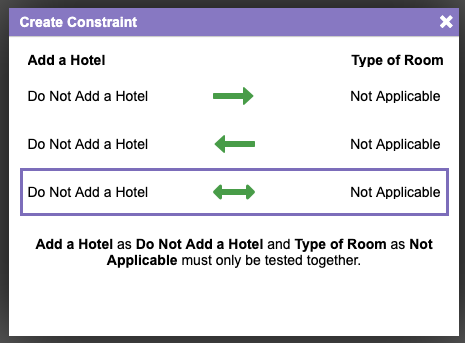 This is because something will need to appear in test cases that include the value "Do Not Add a Hotel". 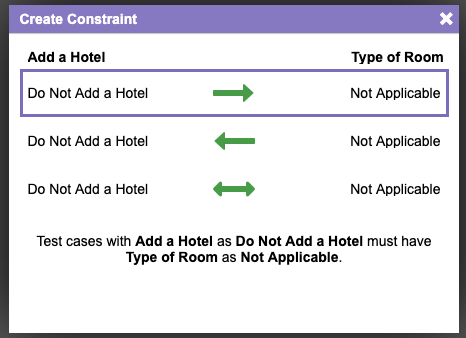 We will want "Not Applicable" to appear for both "Hotel Chain Preference" and "Type of Room" in every scenario that includes the value "Do Not Add a Hotel". 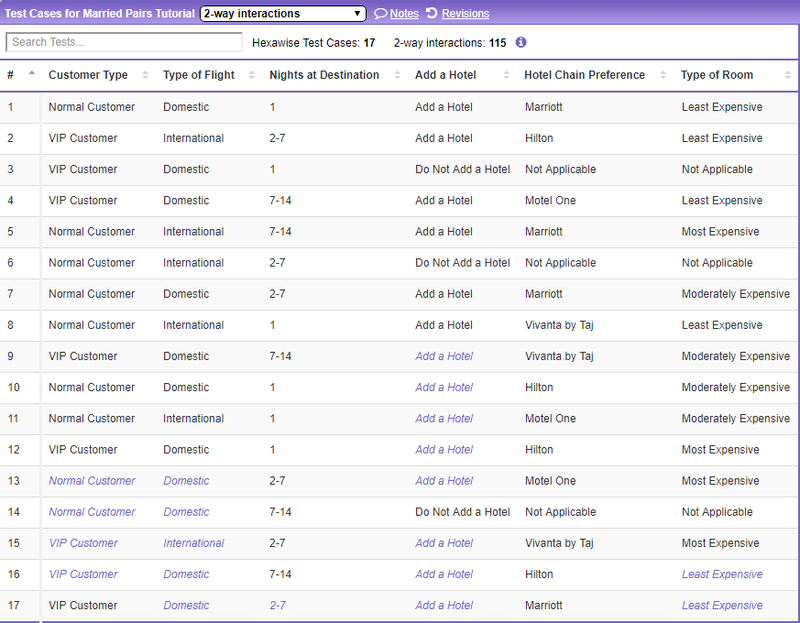 Next, you'll want to make sure that "Do Not Add a Hotel" only gets paired with the "Not Applicable" Values. Namely, it's adding a lot of "Invalid Pairs" as described in more detail here. This is the quick option... Married Pairs! Most of the time when you have "Not Applicable" as an option, you will use "Bi-directional," as in this case. Here, we want "Do Not Add a Hotel" to be paired with Type of Room as "Not Applicable" AND we want to have Type of Room of "Not Applicable" to be paired up with "Do Not Add a Hotel" so we mark this one as a Bi-directional Married Pair. For more information on what each type of Married Pair is, go here. Boom! Pow! Shazam! Problem solved! So what really just happened there? 'Do Not Add a Hotel' with 'Hotel Chain Preference = Marriott' (this combination will never appear). 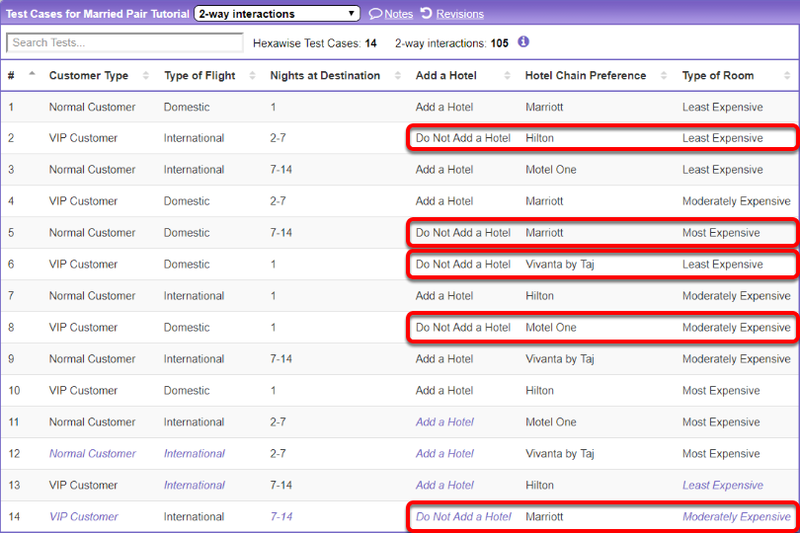 'Do Not Add a Hotel' with 'Hotel Chain Preference = Hilton' (this combination will never appear). 'Do Not Add a Hotel' with 'Hotel Chain Preference = Motel One' (this combination will never appear). 'Do Not Add a Hotel' with 'Hotel Chain Preference = Vivanta by Taj' (this combination will never appear). 'Do Add a Hotel' with 'Hotel Chain Preference = Not Applicable' (this combination will never appear). You can use Hexawise's Invalid Pair feature to accomplish anything that the Married Pair feature can do. The Invalid Pair feature is frequently less confusing to use for new users than the Married Pairs feature. Don't hesitate to use the Invalid feature instead of the Married Pair feature. Especially watch out for situations where you have MULTIPLE related "Not Applicable" values in a plan. Would it make sense to create a "Married Pair" between, say, 'Hotel Chain Preference = Not Applicable' and 'Type of Room' = Not Applicable'? In the example above, it WOULD make sense to include that Married Pair. 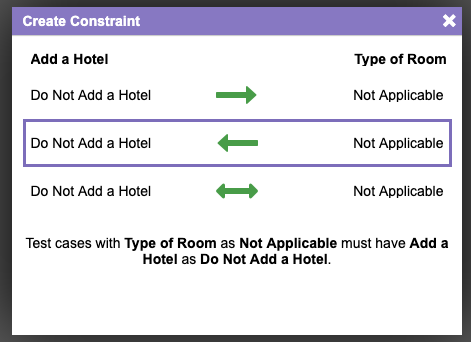 Every time 'Hotel Chain Preference' = 'Not Applicable' we would want 'Type of Room' to also be 'Not Applicable' also. Similarly, every time 'Type of Room' = Not Applicable, we would want 'Hotel Chain Preference' to also be 'Not Applicable'. This is an example of a type of constraint that the human brain would handle effortlessly without even consciously applying logical rules.